Click here for the conference program / el programa definitivo del congreso. For a map of the university campus / plano del campus de Teatinos, click here. 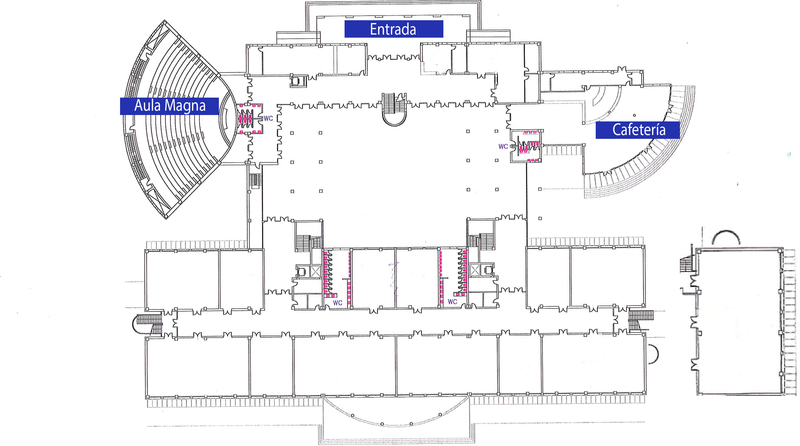 For a map of Communications Faculty building / plano de la facultad, click here. Working in partnership with various research centers – Oxford Centre for Life-Writing (Wolfson College, Oxford University, UK), Medill School of Journalism (Northwestern University, USA), ReSIC (Université Libre de Bruxelles, Belgium), and the Experimental Media Lab (Academy of Fine Arts Saar, Germany) – the research group I.D.E.A. (“Théories et pratiques de l’interdisciplinarité dans les études anglophones”) and the Universidad de Málaga are announcing a call for papers for the conference “Literary Journalism and Civil War.” The conference will be held at the Facultad de Ciencias de la Comunicación, University of Málaga. The keynote speakers will be Mirta Núñez Díaz Balart (Universidad Complutense de Madrid) and Alberto Lázaro (Universidad de Alcalá). A Press Divided: Newspaper Coverage of the Civil War (2014), edited by David B. Sachsman, examines the impact that Northern and Southern presses had on the mediaization of the American Civil War, in particular how both sides’ lack of objective reporting on the people and events leading up to, during, and following the war capture a nation not simply divided but wholly fragmented. In the context of a civil war, journalists are faced with the paradox of covering the war’s tragedies and simultaneously celebrating its victories in some grand, national narrative typical of jingoistic war reporting. When brothers are killing brothers, whom do you choose to support and can you ethically demonize the Other? Literary journalism – or journalism as literature – has proven over time to be one way of tackling the moral ambivalence of civil war reporting by transposing the complexity of values that are at stake. It is not enough to praise military victories – military interventions during civil wars cannot be separated from civilian ones – because the enemy cannot be entirely distinguished and thus dehumanized, since it would make reconciliation near impossible after the war has ended. This journalistic conundrum begs a subjective style of war reporting that can offer more than factographic details of a given battle, that can provide context, commentary and narrative, and that can reveal and heal simultaneously the nation’s gaping wounds. Concerning the American Civil War in particular, Ford Risley, in Civil War Journalism (2012), demonstrates that journalism at the time was more than simply writing about people and events; it was also about writing for the people – civilians and soldiers alike – who are central to any civil war. Presses from the North and South alike did so not out on any political or journalistic ideology but out of the humanist need to speak to one’s own people behind the lines, emphasizing individuals’ stories over bipartisan agendas. Since many of accounts of the Civil War come from the American soldiers themselves, who captured their daily lives in the many troop newspapers published on both sides of the Mason-Dixon line, journalism scholars and historians today are recognizing the need to widen the scope of war reporting. Donagh Bracken even claims in The Words of War (2007) that Civil War reporting has laid the foundation for modern American journalism, and that the war has shaped the press as much as the press shaped the war. How did war reporters respond to censorship, particularly when it came from their own side? Is literary war journalism separable from political beliefs? How much do those beliefs influence the authors in their writings? Is literary journalism only a way to depict events of the moment or is it also a valuable testimony for the future generations on the way their country/nation was shaped? Black correspondents, such as Thomas Morris Chester, who reported on the conflict along with his fight for abolitionism and racial equality, were under-represented in the American Civil War press. How were African American soldiers represented or self-represented in the press during the American Civil War? Can literary journalism, like much of the journalism of the way, or of any war, be considered as propaganda given the humanist political beliefs of its author? Is it the sum total of one ideological point of view? How does literary war journalism tell the stories inside history and give a voice to the people who lived the events of the Civil War? How did journalism during the American Civil War influence the way American literary journalism developed? Can journalistic accounts shape the outcome of the war, and can literary journalism (p)refigure the way that war is remembered? The way journalism evolved during and after the American Civil War influenced the treatment of information in wars to come, from the First World War to the Spanish Civil War a few decades later. It is not by chance, then, that literary journalism as a genre evolved and expanded over time, evidenced in the accounts of the Spanish Civil War by literary authors of international fame, from Ernest Hemingway’s For Whom the Bell Tolls (1940) to George Orwell’s Homage to Catalonia (1938), and from prominent Irish socialist Peadar O’Donnell’s Salud! An Irishman in Spain (1937) to anti-communist Eoin O’Duffy’s The Crusade in Spain (1938). Spain’s civil war between the Bando republicano and the Bando sublevado raised the interest of numerous foreign war correspondents – including several female reporters (previously denied access to the front lines), such as Martha Gellhorn, Virginia Cowles, Andrée Viollis, Gerda Taro and Katharine Stewart-Murray, the “Red” Duchess of Atholl – who were drawn there as much if not more or their political beliefs than they were their professional obligations. In Boadilla, Esmond Romilly writes: “There is something frightening, something shocking about the way the world does not stop because those men are dead.” While the majority of research on Spanish Civil War journalism has focused on these foreign literary journalists, interest is growing on those Spanish writers whose literary war reportages tell the stories from a domestic perspective less bipartisan than the foreign accounts because, as with the American Civil War, they were reporting on brothers and cousins and not Fascists or Communists. Josep Pla, initially tolerant with the Francoists, wrote for the Catalonian newspaper La Veu de Catalunya and distanced himself from the regime when his mother-tongue was banned to private spaces in Spain. Therefore there is not only one kind of literary journalism in Spain during the civil war there, but many, each dealing with a diverse aspect of a common event. The different stories collected from foreign journalists and Spaniards alike on the people affected and displaced by the war show that atrocities were enacted and suffered on both sides of political divide. Historical accounts of the war thus cannot legitimately pit hero against villain, but rather brother against brother, neighbor against neighbor, narratives which combine to overcome divisive ideologies and bind the nation’s collective memory. Is the evolution of literary journalism noticeable from the accounts of the American Civil War to those of the Spanish Civil War? How do the works of Spanish reporters differ from those of their foreign counterparts? How are they be related? How did they influence one another, if at all? How were foreign reporters’ dispatches received in Spain? Were they considered as external points of view and therefore unavoidably biased? How is patriotism expressed in literary journalism in the context of a civil war? Does it always have to be militant? Are journalists working on both sides actually objective in civil wars? Can literary war journalism be considered a means of reuniting the two halves of a single warring nation? How did these civil wars influence the way journalism evolved in the decades that followed? The diversity of viewpoints on these two civil wars is presented as a model for contributions on other civil wars, past and present (e.g., Syria, Afghanistan, etc.). This plurality will allow us understand how literary journalism evolved through civil wars and became a way of bringing together nations that were once – or still are – torn apart. English will be the conference’s principal language, but papers can also be presented in Spanish. Please send abstracts of 300 words and a brief CV to John S. Bak (john.bak@univ-lorraine.fr), Antonio Cuartero (cuartero@uma.es) and Vincent Thiery (vincent8thiery@gmail.com) by 15 February 2017. Trabajando en colaboración con diversos centros de investigación – Oxford Centre for Life-Writing (Wolfson College, Oxford University, UK), Medill School of Journalism (Northwestern University, USA), ReSIC (Université Libre de Bruxelles, Belgium), y Experimental Media Lab (Academy of Fine Arts Saar, Germany) – el equipo de investigación I.D.E.A. (“Théories et pratiques de l’interdisciplinarité dans les études anglophones”) y la Universidad de Málaga anuncian una convocatoria de propuestas para la conferencia “Periodismo literario y Guerra Civil.” Los dos ponentes principales serán Mirta Núñez Díaz Balart (Universidad Complutense de Madrid) y Alberto Lázaro (Universidad de Alcalá). La conferencia tendrá lugar en la Facultad de Ciencias de la Comunicación de la Universidad de Málaga. A Press Divided: Newspaper Coverage of the Civil War (2014), editado por David B. Sachsman, estudia el impacto que la prensa norteña y sureña tuvo en la mediatización de la Guerra Civil Americana, en particular como la falta de ambas partes de periodismo objetivo, fiel a las personas y eventos, llegaron, durante y tras la Guerra a plasmar una nación no sólo dividida, sino completamente fragmentada. En el contexto de una guerra civil, los periodistas se enfrentan a la paradoja de cubrir las tragedias de la guerra y a la vez celebrar las victorias con cierta grandeza, la narrativa nacional típica del periodismo de guerra ultranacionalista. Cuando hermanos se están matando entre ellos, ¿a quién apoyarías? ¿Sería ético demonizar al otro? El periodismo literario – o el periodismo como literatura – ha probado a lo largo del tiempo ser una de las formas de abordar la ambivalencia moral de los reportajes de una guerra civil, transponiendo la complejidad de los valores que están en juego. No es suficiente con alabar las victorias militares – las intervenciones militares durante las guerras civiles no pueden separarse de las intervenciones civiles – porque el enemigo no puede ser distinguido completamente y, por consiguiente, deshumanizado, ya que esto haría la reconciliación casi imposible tras el fin de la guerra. Este enigma periodístico pide un estilo subjetivo de reportaje de guerra que pueda ofrecer más que los hechos de cierta batalla, que pueda proporcionar el contexto, comentario y narrativa, y que simultáneamente pueda mostrar y curar las enormes heridas de la nación. Respecto a la Guerra Civil Americana en particular, Ford Risley en Civil War Journalism (2012), demuestra que el periodismo de la época era más que la simple escritura acerca de personas y eventos, también trataba de escribir para la gente – tanto civiles como soldados – que son centrales a cualquier guerra civil. Medios tanto del sur como del norte lo hicieron no por una ideología política o periodística, sino por la humana necesidad de hablar con su propia gente entre líneas, dando más importancia a historias individuales que a los planes de ambos bandos. Debido a que muchas de las historias de la Guerra Civil vienen de los soldados estadounidenses, quienes recogieron sus vidas diarias en los numerosos periódicos hechos por las tropas norteamericanas en ambos lados de la línea Mason-Dixon, los investigadores e historiadores de periodismo, hoy reconocen la necesidad de ampliar el alcance del periodismo de guerra. Donagh Bracken incluso afirma en The Words of War (2007) que el periodismo de guerra civil ha sido la base del periodismo moderno americano y que la guerra ha dado forma a la prensa tanto como la prensa ha dado forma a la guerra. ¿Cómo respondieron los reporteros de guerra a la censura, especialmente cuando venía de su propio bando? ¿Es el periodismo literario de guerra separable de las creencias políticas? ¿Cuánto de esas creencias influyen a los autores en sus textos? ¿Es el periodismo literario sólo una forma de representar sucesos o es también un valioso testimonio para futuras generaciones sobre la forma en que su país o nación se formó? Los corresponsales negros, como Thomas Morris Chester, quien cubrió el conflicto junto con su lucha por el abolicionismo y la igualdad racial, estaban infrarrepresentados en la prensa norteamericana en la Guerra Civil. ¿Cómo fueron los soldados afroamericanos representados en la prensa durante la Guerra Civil Americana? ¿Puede el periodismo literario, como mucho del periodismo de cualquier guerra, ser considerado propaganda debido a la opinión política de su autor? ¿Es la suma total de un mismo punto de vista ideológico? ¿Cómo cuenta el periodismo literario de guerra relatos dentro de la historia y da voz a personas que vivieron la Guerra Civil? ¿Cómo influenció el periodismo durante la Guerra Civil Americana en el desarrollo del periodismo literario americano? ¿Pueden los relatos periodísticos dar forma al resultado de la Guerra? ¿Y puede el periodismo literario cambiar la forma en que recordamos la Guerra? La forma en que el periodismo evolucionó durante y tras la Guerra Civil Americana influenció el tratamiento de la información en las guerras posteriores, desde la I Guerra Mundial hasta la Guerra Civil Española unas décadas después. No es por casualidad, por tanto, que ese periodismo literario como género evolucionó y se expandiera a lo largo del tiempo, pudiéndose encontrar en relatos sobre la Guerra Civil Española por autores de fama literaria internacional, desde Ernest Hemingway en Por quién doblan las campanas (1940), hasta George Orwell en Homenaje a Cataluña (1938), y desde el conocido socialista irlandés Peadar O’Donnell en Salud! An Irishman in Spain (1937), hasta el comunista Eoin O’Duffy en The Crusade in Spain (1938). La Guerra Civil Española entre el bando republicano y el bando sublevado llamó la atención de numerosos corresponsales de guerra extranjeros – incluyendo varias mujeres periodistas (a las que previamente se les había negado el acceso a los frentes), como Martha Gellhorn, Virginia Cowles, Andrée Viollis, Gerda Taro y Katharine Stewart-Murray, la duquesa “roja” de Atholl – a quienes los habían arrastrado tanto o más sus creencias políticas que sus deberes profesionales. En Boadilla, Esmond Romilly escribe: “Hay algo aterrador, algo impactante acerca de la forma en la que el mundo no para porque esos hombres estén muertos.” Mientras que la mayoría de las investigaciones acerca del periodismo de la Guerra Civil Española se han centrado en estos periodistas literarios extranjeros, el interés está creciendo por esos periodistas españoles cuyo periodismo literario de guerra cuenta historias desde una perspectiva cercana y menos bipartita que las historias extranjeras, porque, como con la Guerra Civil Americana, estaban informando sobre hermanos y primos y no fascistas y comunistas. Josep Pla, inicialmente tolerante con los franquistas, escribió para el periódico catalán La Veu de Catalunya y se distanció del régimen después de que el uso de su lengua maternal fuera reducido a los espacios privados. Por lo tanto, no hay un único tipo de periodismo literario en España durante la Guerra Civil, sino muchos, cada uno tratando un aspecto distinto de un evento común. Las diferentes historias recogidas, tanto por periodistas españoles como extranjeros, sobre gente afectada y desplazada por la guerra, muestran las atrocidades que fueron llevadas a cabo y sufridas por ambos bandos. Los relatos históricos de la guerra, por consiguiente, no pueden, legítimamente, señalar al héroe frente al villano, sino, más bien, hermano contra hermano, vecino contra vecino, la narrativa se combina para hacer frente a las ideologías divisoras y reunir la memoria colectiva del país. ¿Se puede apreciar una evolución del periodismo literario desde los relatos de la Guerra Civil Americana a los de la Guerra Civil Española? ¿En qué se diferencian los trabajos de los reporteros españoles de los de los extranjeros? ¿En qué se parecen? ¿Cómo se influenciaron el uno al otro si lo hicieron? ¿Cómo eran las comunicaciones de reporteros extranjeros recibidas en España? ¿Eran consideradas puntos de vista externos y, por tanto, inevitablemente sesgados? ¿Cómo se expresa el patriotismo en el periodismo literario en el contexto de una guerra civil? ¿Tiene que ser siempre combativo? ¿Son los periodistas trabajando en ambos bandos realmente objetivos? ¿Puede el periodismo literario de guerra ser considerado una forma de unir las dos mitades de una única nación en guerra? ¿Cómo influenciaron estas guerras civiles la forma en que evolucionó el periodismo literario de guerra en las décadas siguientes? La diversidad de puntos de vista en estas dos guerras civiles se presenta como un modelo para cualquier otra contribución sobre otras guerras civiles, pasadas o actuales que se quieran presentar (por ejemplo, Siria, Afganistán, …). Esta pluralidad nos permitirá comprender cómo el periodismo literario evolucionó gracias a las guerras civiles y se convirtió en una forma de reunir naciones que una vez estuvieron o todavía están separadas. El idioma principal de la conferencia será el inglés, pero se pueden presentar también propuestas en español.